"With the addition of Ross and Lucas to our leadership team, Bridgepoint is well-positioned to help companies in the technology, manufacturing and energy sector, optimize and transform their financial and technology operations," said Manuel Azuara, Principal at Bridgepoint Consulting. Bridgepoint Consulting, an Addison Group company and leader in finance, technology and management consulting services, announced the expansion of its Financial Consulting practice in Houston, Texas. This renewed focus in the Houston market, includes the promotion of Ross Goolsby and Lucas Walters, two highly accomplished CFO Consultants, who have been named Directors. Goolsby and Walters will lead strategic efforts to grow Bridgepoint’s rich network of high quality consultants and service capabilities to support middle market companies with a broad range of initiatives, including business process improvement, data analytics, technical accounting and transaction advisory services. Additionally, Bridgepoint’s Professional Search practice, led by Kristi Kershaw, is expanding into the Houston market to support emerging ventures to large, established companies, with securing executive level finance, accounting, audit, tax, treasury and HR roles. Kershaw will also help identify candidates for successful placement with Bridgepoint clients. Bridgepoint Consulting’s Financial Consulting practice provides financial operations solutions to help organizations of all sizes to grow and scale efficiently. From complex financial reporting and process improvement to interim roles and projects, the firm provides extensive expertise to support companies during times of transition, transaction and transformation. Learn more about Bridgepoint’s offerings at http://www.bridgepointconsulting.com/service/financial-consulting. Addison Group’s Houston office, from which Bridgepoint Consulting will operate its Financial Consulting and Professional Search practice, is located on the 10th floor at 1001 McKinney in Houston, Texas. Ross Goolsby has extensive experience in capital markets, including the venture capital and IPO process, international expansion, and merger and acquisitions with high growth companies. He has supported a broad range of companies on all aspects of planning and forecasting, treasury and cash management, investor relations, internal controls, information systems, and SEC compliance and reporting. He is the former CFO of several technology companies, including SigmaTel, HealthTronics and Calxeda. He has experience in a number of industries, including distribution, manufacturing and medical products. He earned a Bachelor of Science in Accounting from the University of Houston. Lucas Walters has extensive experience across multiple executive-level functions, including accounting, finance, HR, IT and facility management. Prior to Bridgepoint, he served as a VP of Finance for a fast-growing Austin startup. He has experience in a number of industries, including energy, manufacturing, software and technology. He earned a Bachelor of Science in Business Administration from Concordia University and a Masters of Business Administration from the University of Texas–Austin. He is also a Certified CPA in the state of Texas. Kristi Kershaw has more than 15 years of progressive experience in professional accounting and finance roles, including Big 4 public accounting as well as private and publicly-traded companies. In 2007, she transitioned into an Executive Recruiter role for a leading executive search firm. Prior to Bridgepoint, Kershaw led the talent acquisition efforts for a publicly traded global medical device manufacturer. She earned a Bachelors in Accounting from Indiana University, and is a Certified Public Accountant (CPA). 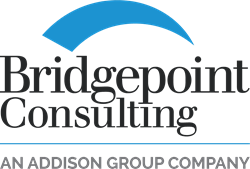 Bridgepoint Consulting, an Addison Group company, is a leading management consulting firm that helps organizations throughout their business lifecycle. Offering a broad range of finance, technology and risk/compliance services, Bridgepoint supports clients from the startup phase all the way to IPO readiness and beyond. Since 1999, the firm has been helping executives and management teams reduce their business and operational risks, bridge resource gaps and improve overall performance. Whether an organization needs interim expertise to improve infrastructure and processes, or strategic management of a major transition or transaction, Bridgepoint’s team of industry leaders is able to provide the critical support needed to ensure success. The firm is headquartered in Austin, with offices in Dallas and Houston and the capability to deliver solutions across the US. For more information, visit our website at http://www.bridgepointconsulting.com, and connect with us on LinkedIn, Twitter and Facebook. Addison Group is a leading provider of professional staffing and permanent placement services for Information Technology, Finance & Accounting, Executive Search, Healthcare, HR & Administrative, and Engineering. Addison’s strengths are its strong management and executive teams, a relationship‐focused selling strategy, a history with clients of delivering the right candidate at the right time, and a loyal candidate base. With over 24 offices in cities across the United States, Addison Group offers a national reach with a localized touch. Learn more at http://www.addisongroup.com.